Your Coda Bow purchase is protected by the bow's individual number registered at Coda and a limited (10-year) warranty from them. See www.codabow.com/promise.html for more information. Want to help your special musician with the best instrument match? A gift card is the perfect way to do that, and it never expires. The Diamond NX offers advanced performance for serious players. Agile and accommodating, the NX elevates advancing players to new levels. The Diamond SX offers premium performance for professionals. 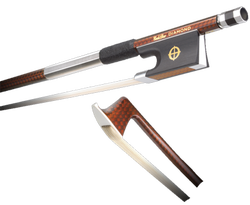 Sophisticated and reliable, the SX is the ideal ‘touring’ bow for every professional artist and teacher. The SX has a premium design using graphite diamond-weave shaft technology and a Kevlar acoustic core with a natural graphite tint. It has a natural carbon-fiber-weave slide, nickel-silver fittings, Moroccan leather grip, sterling silver winding, a fiber-reinforced composite tip plate, composite wedges/plugs, and Gold Medal stallion hair. Designed for professionals, the Diamond GX offers performance once reserved for only the finest pernambuco bows. The GX has a premium design using graphite diamond-weave shaft technology and a Kevlar acoustic core with a natural graphite tint. It has a tinted diamond-weave slide, sterling silver fittings, Moroccan goat skin grip, sterling silver winding, a fiber-reinforced composite tip plate, composite wedges/plugs, and Gold Medal stallion hair.